This item is not available for sale on this site. So sings the Cactus Wren, one of the ten desert creatures that speaks for itself in the evocative and lyrical verses of Desert Voices. 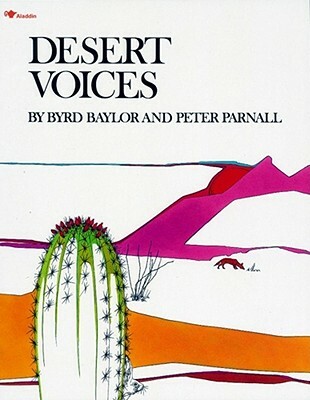 In both text and illustration, Desert Voices conveys a message of spirit and courage from the shy and quiet creatures of the beautiful desert land. Byrd Baylor lives and writes in Arizona, presenting images of the Southwest and an intense connection between the land and the people. Her prose illustrates vividly the value of simplicity, the natural world, and the balance of life within it. Sign-up for our free e-newsletter! Dear Friends, Please note: we are fulfilling only Susan Lang's and Michaela Carter's signed editions online at this time. Please give us a call 928.445.9000 for more information.